I don't know which fact is weirder: that it's been more than a month since I published one of these "Shall We Do It?" write-ups or that the last one also included impressions of two of the same 3DS games I'll be chatting about in today's post. I guess the two facts kind of go hand in hand, though, don't they? After all, THE "DENPA" MEN 3 and, especially, Tomodachi Life have conspired to take up most of my gaming bandwidth, so to speak, over the last few weeks--the exception being the handful of PC Engine platformers I've played in honor of apricotsushi's #PlatforMonth extravaganza--and that, in turn, has prompted me to drag my feet a bit when it comes to prepping these posts. So, why did I decide to publish one today? Basically, I finally feel as though I've made enough progress in both of the aforementioned games to talk about them again. I'm not sure the same can be said of my experience with Monster Hunter 3 Ultimate, sadly, but let's hold off on talking about that until after I've said what I have to say about Tomodachi Life and THE "DENPA" MEN 3. Anyway, ever since I blew through that hour-seven bottleneck, THE "DENPA" MEN 3 and I have been on a roll. I just crossed the 24-hour mark last night, and I believe I've at least passed the halfway point of my playthrough by now. I still have some issues with this quirky RPG--the main ones being its boring NPCs and its sometimes-nightmarish difficulty spikes--but they're far enough in the background at this point that they're only rarely (OK, occasionally) interfering with my enjoyment of this not-so-pint-sized adventure. Tomodachi Life--To those of you who are impressed that I've spent over 24 hours with THE "DENPA" MEN 3 thus far: just wait until you hear how much time I've put into Tomodachi Life. Would you believe my total playtime's now over 100 hours? I sure can't. Well, that's not entirely true, as I've found this weird life sim to be pretty darn fun since my first few minutes with it. I wish I could update you as to how many Miis now populate my Rainbow Island, but I lost count some time ago. I think there are about 60 or 70 now? I can tell you how many married couples I have, though: 16. Three of them are gay, by the way. (Me and Ganondorf, Shigeru Miyamoto and David Bowie, Madonna and Daisy.) Oh, and I think all of them have had kids so far--or at least the huge majority of them have. Most of them have had more than one kid. Case in point: Ganondorf and I are on our third, with no end in sight to our child-rearing shenanigans. How many more hours will I put into this title? I have no idea. I definitely can feel my interest waning a bit, though, so if I were forced to guess I'd say it's got about 20 hours of life left in it. 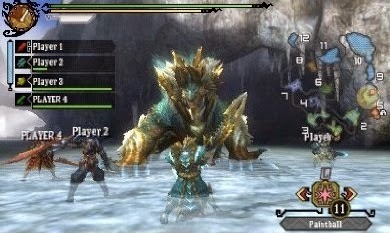 Monster Hunter 3 Ultimate--So, here we are: my first real impressions on Monster Hunter 3 Ultimate, a game that I've owned for ages now but have only just gotten around to sticking into my 3DS. The quick-and-dirty version of my thoughts so far would be that I absolutely love it, although I've barely scratched its beautiful surface. There's no real reason I've only put a few, measly hours into MH3U while I've put loads and loads into Tomodachi Life and THE "DENPA" MEN 3--other than the latter two have just secured a bit more of my attention as of late, I mean. That said, I'll certainly be returning to it with a passion as soon as I've stopped playing either or both of the aforementioned titles, as I found its first couple of hours to be surprisingly engaging given the assumptions I formed about it before I ever booted it up. One of those assumptions, it should be stated, was that there would be little to Monster Hunter 3 Ultimate other than its famed and ferocious battles, while another was that said fights would be awkward to control (a la the old Resident Evil games). Neither of them have proven to be true, thankfully, so I'll consider this a lesson learned as far as forming assumptions about games I've yet to play are concerned. Granted, I have no idea what I'd do with them once I got them, but that's beside the point. I especially want the last four on the bottom row of the following image, by the way. I've yet to see their in-game inspirations, but I want them all the same. 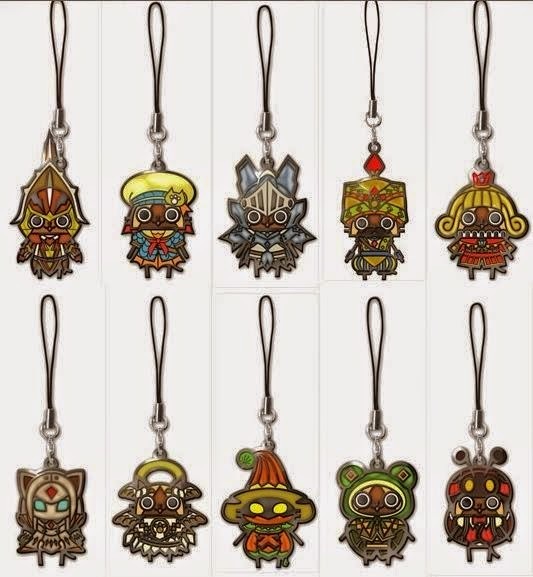 Each of these Monster Hunter-inspired accessories measure five centimeters by four centimeters (or 1.96 inches by 1.57 inches, I believe) and all are made of zinc alloy, epoxy resin, iron and nylon. The whole she-bang (all 10 "straps") can be pre-ordered at shopncsx.com for $50.90, with shipment expected to occur sometime in late November. 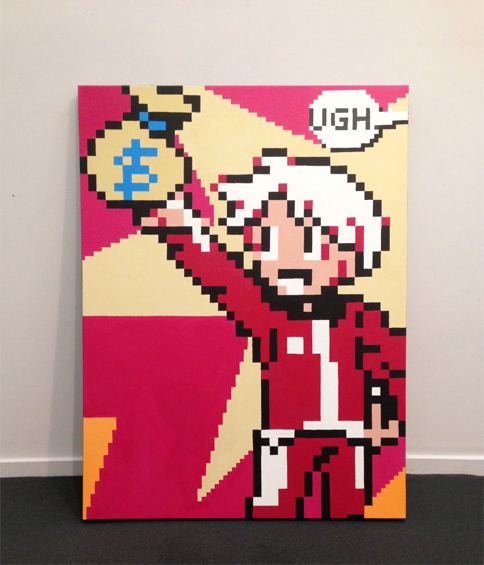 OK, so the actual title of the colorful piece of pop art, produced by deviantartist melonjaywalk (aka Francis Gordon), that serves as the focal point of this post is "Hero." I really love the speech-bubble-wrapped "ugh" that appears in its upper-left corner, though, so that's what I went with when I came up with the header above. Anyway, should one or more of you fine folks know which game the sprite showcased in "Hero" was pulled from, I'd greatly appreciate being enlightened as to its name in the comments section below. Now that I've seen it, I'd really like to know how TV viewers at the time received it. Did they consider it corny or cheesy, as most of us surely would today, or did they consider it kind of cool? Or maybe the target audience simply reacted to it with awe, which is how I probably would have reacted to it. It did, after all, herald the coming of a new entry in the Legend of Zelda series. You know what? Now I'm thinking Nintendo of Japan should've made a sequel to this commercial in order to promote last year's A Link Between Worlds. Doing so certainly couldn't have hurt.